Already thinking about a summer camp for your child this year? Here's something to consider when researching your options. Camp is so much more than a summer vacation, and can provide a positive opportunity for growth. It can be an integral part of a child's educational and social development. Children learn to challenge themselves at camp, on levels that they have never explored. For the first time, they must leave a familiar environment and encounter campmates who may have different values or behaviors than they are accustomed to. They must learn to negotiate and resolve conflict. They must learn to deal with stress in a socially acceptable manner. They must learn to include instead of exclude. They need to actively employ the word ÒcontrolÓ. They must learn to be responsible for themselves and others, to assess and differentiate between appropriate and inappropriate behavior. In essence, they learn a stronger sense of self. Camp can provide the background for this growth in a safe and controlled environment. How can parents find the right program that will successfully support these opportunities for their children's growth? Talk to other children and parents. Referrals from other families with camp experience are a great way to get the real scoop. Remember, it is sometimes difficult to recognize when your child may need a different program than his or her best buddy. Talk to camp directors. Each director should have a clear sense of what children should gain from their experiences and how to go about teaching these skills. If the director cannot adequately answer your questions about camp philosophy, home communication, supervision or safety, then it's probably not the right camp for you. Camp can be the experience of a lifetime. Explore the options available for your children. With so many diverse programs available, you're certain to find one to meet your family's needs. Happy camping! 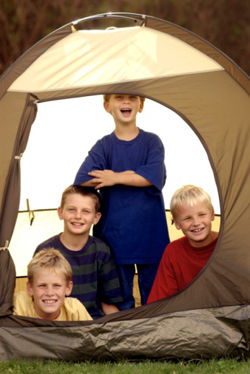 Tell your friends and family to visit www.CampsAndPrograms.com for everything camping related.